"You Get What You Pay For!" As a Senior Customer Advocate, Kim transfers loyalty program members' information from enrollment forms into a generated database program. 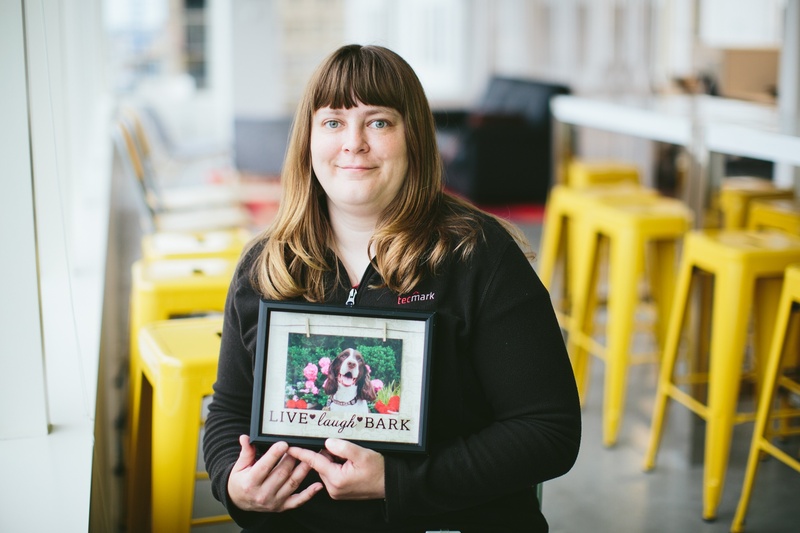 She productively manages all inbound requests from clients and program managers. She also manages the department workflow logistics, among a million other things. She recently took over Tech Support and helps salons with Verifone related tasks - which is very challenging and she says it tests her every day. "You get what you pay for" - or, as I like to say, you pay for what you get. New challenges, being able to do a good job and get complimented for doing a good job. Best advice anyone has ever given you? To ignore what other people think and think for myself. Don't let people fill my head with stuff. Family, friends, and my dogs. Empire at the moment - that hour goes by fast! I have 2 dogs and they are my life. I have a Springer named JJ and my boyfriend's Golden Retriever, Tracker. They are spoiled rotten and go everywhere with me. I would bring them to work with me if I was allowed. What is a hobby/talent you have that most people don't know about? I love building stuff and doing crafts. Clay Matthews. I am in love with him and the Packers. Personally, I would like to meet all of the Packers. You can contact Kim at kagudo@loyaltymarketing.com or 612.746.5098.